"D'azur a une colline de trois coupeaux d'or, mouv. De la p., vomissant des flammes de gu., Sommee d'une etoile d'or et accostee de deux autres etoiles du meme." "Blue; a Gold Mountain with three hills spitting red flames, issuing from the base, surmounted by a Gold Star accompanied by two other Gold Stars." "A man issuing dressed blue, wearing a Blue Pyramid shaped hat and supporting in his hand a Volcano surmounted by a Star." 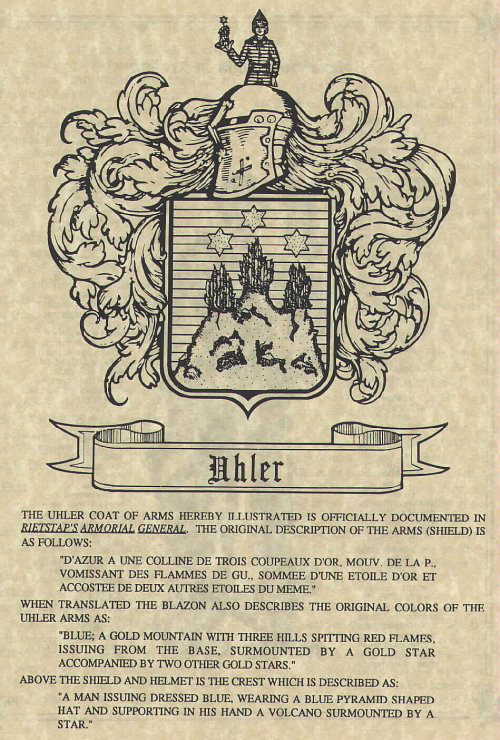 I have posted the Uhler Family Coat of Arms for our family and those interested in pursuing our family line and/or history. I have two large files (gif & jpg), so you can look at it on the net and download it if you would like. I also have two smaller files (gif & jps) that are printable on 8 x 11 for those who would like a copy. If you know of any other family web sites or links, please let me know! I will be adding other Uhler Family Genealogy, History and Information to this site. If you have any comments or suggestions, they are Welcome!